About The Larkin Law Firm, P.C. Our team of Birmingham employees have years of experience working both in and out of Birmingham, Tuscaloosa, and West Alabama areas courtrooms, with clients of all backgrounds and ages. We concentrate in Civil Law which includes: Personal Injury, Products Liability, and Probate. You can always count on us to take the time necessary to clearly explain your case’s procedures and status so that you are up to date on every development at all times. As we understand that charges and matters of the law are often unplanned and happen without notice, once we take your case, we always ensure that someone is available to dedicate time to your case. The sooner you have Attorney Larkin on your side, the easier it is to build a strong case and work toward a successful resolution. . The law office of The Larkin Law Firm, P.C. has been proudly serving the Birmingham, Tuscaloosa, and West Alabama areas communities for many years. With our main office in Birmingham, The Larkin Law Firm, P.C. easily serves those in need of legal services throughout Alabama, including the cities of Anniston, Gadsden, Huntsville, Mobile, Montgomery, and Tuscaloosa. We are extremely proud to be able today to offer legal advice, legal counsel and representation in most civil issues. The Larkin Law Firm, P.C. welcomes your call or visit, by appointment, regardless of your legal situation or budget. Depending on the case and specific situation, we are in some cases able to represent you on a contingency fee basis. In most cases involving monetary compensation, you do not have to give us a penny unless and until we help you win your case. You have nothing to lose and everything to gain by calling us for advice or more information. At The Larkin Law Firm, P.C., our utmost priority is to support and represent the community. No case is too big or too small for our dedicated team. We will work on your behalf until we are satisfied that we have done absolutely everything in our power to bring resolution to your case. Attorney Tom L. Larkin is the Founder and President of The Larkin Law Firm, P.C., a Birmingham-based law firm. In 1976, Attorney Larkin graduated from Cumberland School of Law at Samford University in Birmingham. He was admitted to practice in Alabama in September of 1976. Early in his career, Attorney Larkin was a general practitioner. He partnered with Arthur D. Shores, a renowned civil rights attorney to establish the law firm of Shores & Larkin. 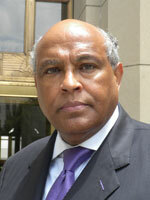 Attorney Larkin went on to become the first full-time African American professor at Cumberland School of Law in 1979. In 1991, Attorney Larkin teamed up with his law school friend, Steven Tipler, to form one of the first multi-racial plaintiffs’ personal injury firms in Alabama. Attorney Larkin practiced with Attorney Steven Tipler in the law firm of Tipler Law Offices, later renamed Tipler Larkin Trial Lawyers, until 2009 when he opened the Larkin Law Firm, P.C. Attorney Larkin is a life member of Omega Psi Phi Fraternity (1968) where he has held the offices of 7th District Counselor, State Counselor and District Social Action Chair. He currently serves as the District Rules Chair for the 7th District. Attorney Larkin is presently a board member of Children’s Dance Foundation and F.O.C.U.S. (Females On Course Using Steps). Attorney Larkin is the immediate past Sire Archon of Sigma Pi (Boulé) Southeast Region.